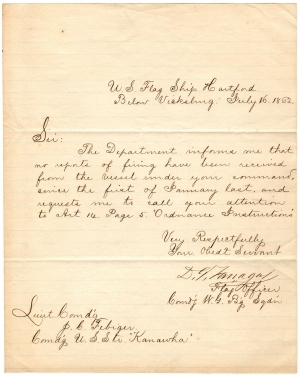 Unaware of his promotion, Farragut writes as “Flag Officer” to Lieutenant Commander J. C. Febriger of the U.S.S. Kanawha reminding him of ordnance protocols and reports. DAVID FARRAGUT. Letter Signed, to J.C. Febriger. Vicksburg, Miss., aboard the “U.S. Flag Ship Hartford. Below Vicksburg,” July 16, 1862. 1 p., 8 x 10 in. With the original transmittal envelope. In honor of his capture of New Orleans— a critical victory that gave the Union control over one of the Confederacy’s most important seaports— Congress promoted Farragut to Rear Admiral, the first time in U.S. history someone had been appointed to that rank. 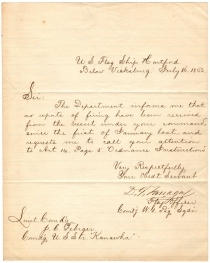 That same day, still unaware of the honor, Farragut signs the present letter as “Flag Officer” in command of the Western Gulf Blockading Squadron. Following the April 1862 capture of New Orleans, Farragut quickly moved his fleet up the Mississippi to attack the key Confederate stronghold of Vicksburg. In May 1862, he steamed upstream to demand the city’s surrender, but lacking enough troops to force the issue, returned to New Orleans. In June Farragut led a larger flotilla that bombarded Vicksburg until the end of July, but he lacked sufficient support from Union land forces. By the time Grant began moving on the city from the north, Confederate forces had heavily reinforced its garrison, making an easy capture impossible. It took another full year, until July 4, 1863, for Vicksburg to fall. At the time of this letter, the U.S.S. Kanawha was stationed off Mobile Bay, an important Confederate port that would not be closed until Farragut commanded a squadron against it in August 1864. This letter suggests that the Kanawha was inactive, but it had, in fact, captured numerous blockade-runners out of Mobile following its arrival off the Alabama coast in February 1862. The Kanawha remained on patrol off Mobile Bay until the spring of 1864 when she was reassigned to the Texas coast. Fine. Expected folds, extreme light toning along margins.